This weekend was rather odd - a cyclone was supposed to hit Perth Sunday morning, but then changed to Sunday night, but then never came at all. Instead, what we experienced was incredibly hot and humid weather, overcast with a bit of rain and thunderstorm elsewhere. Outside it looked like winter, but it sure didn't feel that way. So with the overcast weather, I was in the mood to bake. 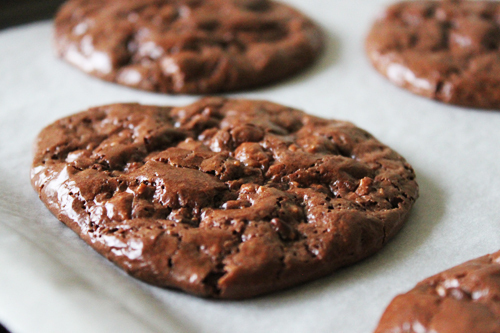 I’ve had this Chocolate Puddle Cookies recipe for a while now, and have waited for the right time to make it. It originally came from 101 Cookbooks, but I found it looking through Everybody Likes Sandwiches. These cookies were A-mazing! They were hard and chewy on the outside, and soft and gooey on the inside. Drool. The batter makes 18 large cookies, and large they are, so feel free to make smaller ones and therefore double the amount (make sure to cook for only 10 minutes if making smaller ones). The only thing I changed was the exclusion of sunflower seeds, as I didn’t feel they were right for this recipe. I used very large eggs which made the batter quite runny, so I would suggest adding most of the egg whites, stir, and see if it needs more. They will spread thinly when you drop them on the tray, but will soon rise in the oven. In a large bowl, add the icing sugar, cocoa and salt and mix well. Add in the chocolate, nuts (and seeds is you like) and mix. In another bowl, stir together the egg whites and vanilla, and then add to the cocoa and chocolate mixture, and mix well. On a baking tray lined with baking paper, place 1 tablespoon size drops of the batter. Leave a good amount of space between cookies as they will expand while cooking. Bake in the oven for around 15 minutes or until the cookies lose their shine and become matte. Let them cool before removing from the paper. Repeat process until all cooked. These look really yum! I'm going to send Leish the link, she's making baking her thing this year. OMG Tash, these look good! Okay so no more cooking at my house you need the gang round to yours for some dinner YUM! Leon get Leish to make these, they are amazing! Mackie I know, it's well over due. Don't worry there will be a dinner..
these look so amazing! I was just running through the contents of my pantry in my head to see if I can make them tonight, but unfortunately I think I will have to delay them till after going to the shops if I want to do them justice!